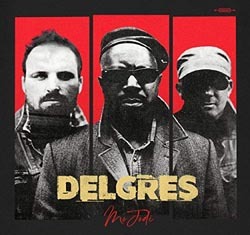 “It was like a journey,” says Pascal Danaë of how Delgrès, his 3-man band, reached fruition from a seed that was planted in the ancestral soil of the Caribbean island cluster of Guadeloupe and watered variously in Paris, West Africa, the Mississippi Delta, and more. As he tells it, Danaë was living between Amsterdam and Paris, where he was born, knocking around as a session musician, when, ”I started playing a little bit of blues just because it was a hard time in my life, and I started strumming the guitar, the Dobro guitar, playing a little bit of slide, and I just closed my eyes. I let things come out, and I started singing in Creole. I grew up listening to my parents speak Creole all the time, and it was in my culture. It was part of my blood…" But, he had never sung in Creole before, nor considered his own culture integral to his music. From that discovery he would form his own band, named after Louis Delgrès, a Guadelupean Creole colonel in Napoleon’s army who martyred himself, in 1802, resisting France’s attempt to retake the territory and reinstitute slavery less than ten years after it had won independence and manumission. Earlier, in 2011, Danaë cofounded a global music project, Rivière Noire; its integration of players from Brazil, France, Mali, the Indian Ocean and Guadeloupe inspired him to incorporate into the firmament of Delgrès sounds from other sources, too. When Rivière Noire disbanded, Danaë asked the band’s hot-shot drummer, Baptiste Bondy, to join him. Says Bondy, “When Pascal asked me to play with him in this new band, of course I said yes, because we had a very good musical connection.“ Danaë returns the sentiment with, "You would go from African rhythms to nearly progressive rock vibes. That's why we had to start playing together.” Also uniting the two was their shared fervor for Mississippi Delta Blues. A final instrument would need to supply the bass line with that “oomph” that gets you to “dance and walk at the same time,” Danaë says. 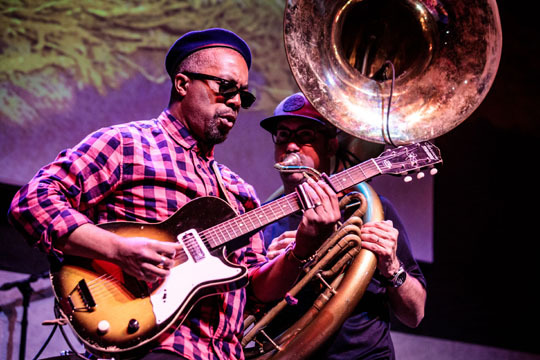 It came out of the New Orleans marching bands that gave us Louis Armstrong, the Neville Brothers, and others, in the mammoth form of the sousaphone, the tuba-spinoff designed by John Phillip Sousa expressly for the streets. Danaë found sousaphone player, Rafgee, through the Paris grapevine. 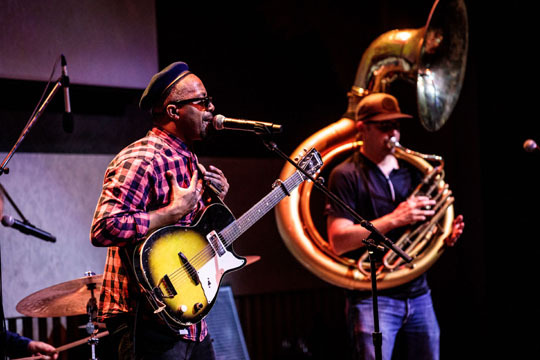 He’s a conservatory-trained trumpet and trombone player who came to the sousaphone after experimenting with bass tones on his trumpet. 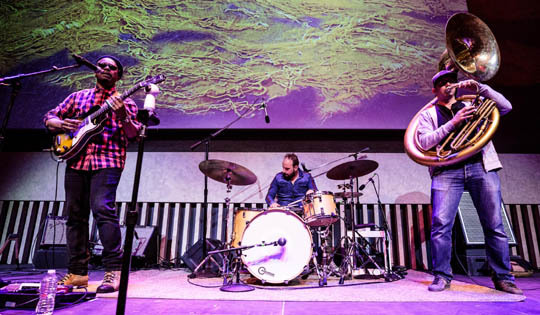 The three put the band together and hit the road, playing mostly music festivals in Europe and North America, appearing at New York’s Global Fest 2018 where they generated an enthusiastic buzz. Plans were then launched for a recording and a major tour. The result was Mo Jodi, a tribute to Louis Delgrès and to freedom fighters everywhere. The recording packs a wallop of sound while amplifying some of the more nuanced sound values overpowered by the high voltage of their live gigs. For example, at times a listener can pick up the lovely synchronized vibrations from within the sousaphone’s gate-mouthed bell and the quivering strings of Danaë's guitar. Their sound is a blend of power and plaint, of the political and the personal, epitomized by the emotional range of Danaë’s vocals as he moves from indignation to intimacy, from a low tenor to searing accents in falsetto. The title cut voices Delgrès’s stormy refusal to bend to his commander, visualized by Bondy masterfully signaling, first, the invading army’s drum corps, followed by his driving bass drum summoning the colonel’s deep and defiant “No!” "Mo Jodi" is a rousing integration of rock, the French Caribbean and the Delta; it’s the quintessential Delgrès. "Vivre Sur la Route" (Living on the Road) has a light, vintage reggae touch as well as flashbacks to the Beatles in the Penny Lane-like Baroque trumpet chorus and Danaë's intermittent, Harrisonesque, bittersweet guitar phrases. "Séré Mwen Pli Fo" (Hold Me Tighter) expresses lushly the band’s deeply personal side. It is a lament of leaving, a duet between Danaë and Skye Edwards (from the alt-rock Brit band Morcheeba), given added heartache by the twang of country rock in Danaë's vocals and guitar. "Perdoné Mwen" (Forgive Me) is also emotive, an apologia to Danaë’s sister for globetrotting in search of self and success while she minded their aging parents at home. 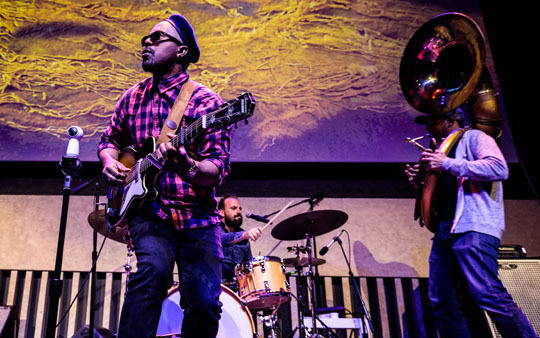 The band returned to New York City in early July for two gigs on one day, the first, a sun-baked affair at Brooklyn’s MetroTech, with the nightcap at the Atrium at Lincoln Center. Delgrès’s growth in the seven months since GlobalFest is noteworthy: they’re more freewheeling, more relaxed performing as a unit, and more engaged with the audience. Rafgee has come into his own, moving easily about the stage, even dancing. In a fetching scene shift, he lays down his big bear of a horn and extracts, from his pocket it seems, a pocket trumpet, trading his profundo bass accents for sweet and soulful melodic lines.